As the West German economy recovered in the 1950s, a growing middle class looked for new cars. Mercedes-Benz responded with the “ponton” series of full-width, unibody sedans, which would carry the company through the next 10 years. The 180 was launched in 1953 as a replacement for the pre-war 170 V, but it was a fairly basic four-cylinder car that would become the mainstay of taxi companies. In March 1954, the six-cylinder 220a adapted the 180 into something grander. The wheelbase was stretched almost seven inches. Four inches accommodated the 2,195cc OHC six-cylinder engine, while rear legroom increased almost three inches and made room for quarter light windows in the rear doors. The engine came from the previous 220 model, but the new 220a was cutting edge. The unibody construction was light and extremely rigid, and the detachable front sub-frame carried the engine, gearbox and coil spring independent front suspension. The familiar coil-spring swing axle supported the rear. The early 220a was quite basic, with cloth interior and little chrome trim, but the single carburetor engine generated 85 bhp and could power the car to 86 mph. Three new models were introduced in 1956 and the Hydrak hydraulic gearshift was optional. The first new model was the four-cylinder 190, an update of the four-cylinder 180, with an OHC 1,897cc engine. The second was the 219, which combined the 2,195cc six-cylinder engine of the 220a with the shorter 180 body, stretched ahead of the cowl for the long motor. The model can be recognized by the lack of rear quarter windows and short rear doors. With higher top speed, the 219 found its niche on the autobahn, and 27,845 were sold from 1956-59. In 1956, the barebones 220a was replaced by the more luxurious 220S sedan, and a pair of deluxe two-door models were added. A two-door cabriolet appeared in May 1956 and a hardtop coupe in 1957. With twin Solex carburetors the 220S developed 100 bhp, raised to 106 bhp in 1957 with higher compression ratio. All three 220S models topped out at 99 mph. The luxurious coupe and cabriolet offered two-tone paint, fitted luggage, a bench seat instead of two buckets, and whitewall tires. The two-door models had a 4.7-inch shorter wheelbase; the interiors featured wood and leather and Becker or Blaupunkt radios were frequently fitted. The 220S series was Mercedes-Benz’s principal entry in the mid-sized luxury class and 55,279 sedans were sold between March 1956 to August 1959. 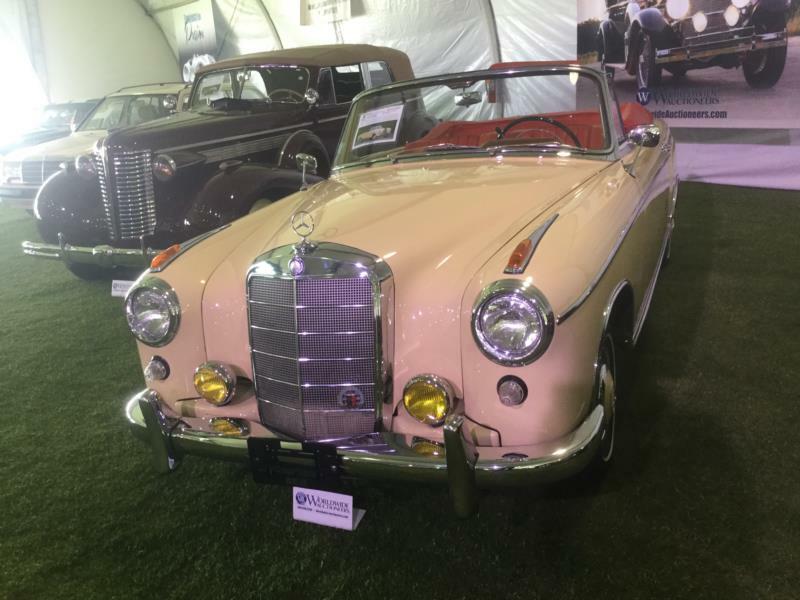 The far more collectible convertible attracted 2,178 buyers while 1,251 coupes were built. At the top of the 220 family was the 220SE, which was fitted with Bosch fuel injection. This boosted power output to 115 bhp, with corresponding flexibility. Pre-production models were built in April 19578, but the lines started running in September and the 220SE ponton sedans were built until August 1959. It was a manifold injection system, rather than direct injection. That would be fitted to the 220SEb model which was upcoming in the fintail models. However, the coupe and convertible ponton 220SEs were built until until November 1960 and the last ones received the more sophisticated direct injection. The 220SE and 220S models are indistinguishable apart from the fuel injection, but the 220SE models are much rarer. There were only 1,974 SE sedans, 1,112 convertibles and 830 coupes. Coupe and convertible models are the most collectible and fuel-injected cars command a premium. They are sturdy and reliable with only a tendency to rust and a rather fragile water pump.